김진재, 김유석, 황태석, 김영석,(2019).모터 조립 및 재제조를 위한 케이스/스테이터 공차분석.한국정밀공학회지,36(4),407-412. The manufacture of BLAC motor requires the motor stator (electric steel plate) and the motor case (aluminum die casting material) maintain strong contact to support the resistance of rotating moments against the rotational moments of the rotor. If there is small reverse rotational moment, the motor stator rotates easily, and damages the motor. To prevent a strong reverse rotational moment, interference fit between the motor stator and the motor case manufactured through heat shrinkage is required. 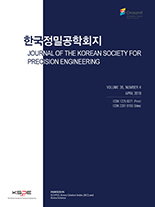 This study, considers the tolerances that may occur in the manufacturing process of assembling stator and case, the contact pressure range that can occur in the heat shrinkage and the moments that can be supported by the motor stator. These are verified through the finite element analysis. The result validates finite element analysis as compared with theoretical values.